4th MG Battalion - NOTE When looking for names associated with this unit you will need to also check the 4th (/explore/units/32), 12th (/explore/units/105), 13th (/explore/units/351) and 24th (/explore/units/449) MG Companies which were all consolidated to form the 4th MG Battalion in early 1918. The 4th Machine Gun Battalion was formed in March 1918 and consolidated the Machine Gun Companies of the three brigades within the Division; the 4th (NSW), 12th (Vic) and 13th (Outer States), and the 24th Machine Gun Company (the latter being one of five numbered 21- 25 raised to give each Division an extra MG Company). They were allocated to sections of the line in detachments of varying sizes depending on the task, but generally as a minimum in pairs as a 'section'. However their employment was still on the basis of providing the formidable fire support that massed machine guns were capable of. The elements of the MG Battalions and Companies were allocated to sections of the line in detachments of varying sizes depending on the task, but generally as a minimum in pairs as a 'section'. 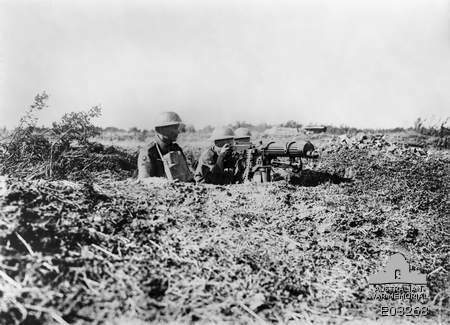 The 4th Machine Gun Battalion saw extensive action in the German Spring Offensive, during the Peaceful Penetration phase, at Le Hamel and in the Last Hundred Days campaign. Elements of the Machine Gun companies and Battalions were allocated to sections of the line in detachments of varying sizes depending on the task, but generally as a minimum in pairs as a 'section'. Accordingly, the service histories of MG Companies and Battalions reflected that of their parent Brigades and Divisions. The men were often similarly drawn from the Battalions of the Brigades and Divisions to which the Machine Gun Companies / Battalions belonged. Detailed accounts of their activities are contained in the respective war diaries available through the AWM (see link in side panel). MG Companies and Battalions were equipped with the legendary Vickers Medium Machine Gun. The Vickers, its German equivalent and artillery on both sides defined and dominated the battlefiled up until mid 1918. The Vickers medium machine gun was served by a crew of three and mounted on a tripod. It was not easily portable and was generally sited in a prepared fixed position. Its direct counterpart on the German side was the Maxim 'Spandau' MG08, a weapon of similar appearance and capability. Both the Vickers and MG08 had a distinctive appearance largely because of a cylindrical water jacket sleeve around the barrel which was designed to cool the barrel when firing at the rapid rate. The MG08 was mounted on a characteristic 'sled' rather than the tripod of the Vickers. They achieved continuous fire through the provision of ammunition in canvas belts (see photo). They would be sited to provide flanking fire across a defensive front, often covering belts of barbed wire or other obstacles forcing the enemy to attack through their line of fire with devastating results; a tactic known as "enfilade fire". They were often the lynch-pin of defensive positions and thus the object of enemy attempts to neutralise them as a prelude to attack, by mortar, artillery fire or even raids by parties of grenadiers with hand and rifle grenades. In attack they would be sited to provide indirect 'plunging fire' into enemy positions in depth at long range to prevent enemy reinforcements reaching the objective of the attack, or to disrupt attempts to withdraw, in a manner not dissimilar to artillery. Machine guns and artillery between them were the dominant influences on the battlefields of the Great War until late in the war when manoeuvre regained importance with the advent of armoured vehicles and ground attack aircraft that could suppress enemy defences.